GTEV Edelweiss is sad to report that its Ehrenvorstand, Joseph Gassel, passed away on November 9, 2017, at the age of 88. Joe was Vorstand of Edelweiss from 1991-1999. 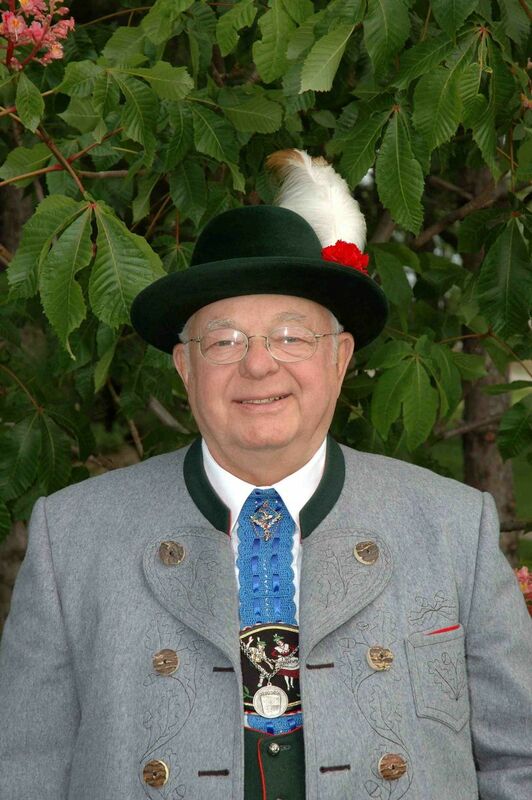 Shortly after the end of his tenure, he was named Ehrenvorstand for his many years of dedication to our Verein. He and his wife Helen joined Edelweiss in 1972 and were active dancers for many years. We will miss Joe's friendship and his big smile. His fellow members and friends extend their deep sympathy to his beloved wife Helen and their children and grandchildren. Services will be held on December 5, with viewing at 10 am and service at 11 am. Lunch is by invitation. Look under the right hand column labeled "Newsletter" to see the latest wonderful newsletter from our editor, Michelle Uebrueck. Our beautiful Gedächtnismesse is coming right up! This annual mass, dedicated to the memory of those members who have passed away, is a day of remembrance for both GTEV Edelweiss and Austrian Society members. The mass is at 2 pm and all are welcome to attend. The music by members of Edelweiss is always outstanding. And worshiping together with Father Reckker doing the homily is a special experience. After the mass, we have a luncheon -- anyone with a reservation is welcome to attend. Please let Annette know you are coming by calling or texting her at 248-840-1953 by November 6 so we can plan the right amount of food and beverage. Lunch meat, rolls, bread, beer, wine, and soft drinks are provided for $10/person ($5 children 12 and under). Pay the day of the luncheon. Those attending are asked to bring a side dish or dessert to share. The resulting buffet provides a most delicious and filling lunch. It's also a time to enjoy the company of your fellow members and even listen to some wonderful music. If you've celebrated with us before, you know how beautiful the day is. If you haven't been before, we hope we'll see you there. Luncheon - at St. Clement - $10/person ($5 children 12 and under) - need reservation by Nov. 6 at 248-840-1953. Bring a side dish or dessert to share. Beer, Brats & Brass Sept. 30 Tickets Available! 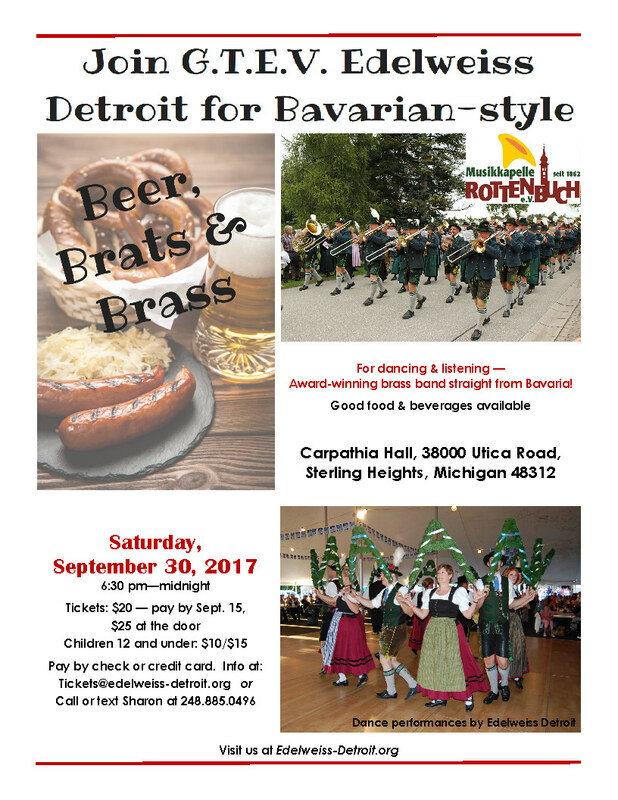 We're excited about having a 40-piece brass band directly from Bavaria at our "Beer, Brats and Brass" event on Saturday, Sept. 30. The award-winning brass band Musikkapelle Rottenbuch will be visiting with us here in the area for a couple of days. The highlight, though, comes on Saturday night when they play their terrific music. Tickets are still available. The advance ticket price is $20/person; after Sept. 15 the ticket goes up to $25/each. (Children 12 and under pay $10 in advance/$15 after 9/15.) Find out how to order tickets from the flyer. For any friends coming from out of town, this link has information about hotels in it. Read more about Beer, Brats & Brass Sept. 30 Tickets Available! Just a few more days until we get together to eat great food, have some refreshing drinks, hear terrific music, and see each other after a few weeks apart! Looking forward to seeing everyone. More info under the "Events" column -- or click here. PS: There's a map in the July Wegweiser to help you get there. Reminder to those on the Rottenbuch committee -- we'll have a meeting at 1 pm in the park.